A good start is essential for a great finish. This is even more important with seed germination, growth and harvest. Ignites2 (referred to simply as "Ignite") helps increase seed germination while getting your crops and grasses up and growing before environmental stresses can rob them of health, vitality and yield increases. Ignite helps your crops reach their genetic yield potential by boosting plant growth, increasing nutrient uptake, strengthening the plants natural defenses, increasing resistance to diseases, building a robust root system and increases the plant's ability to endure environmental pressures. 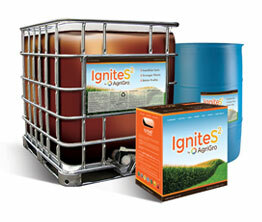 Fertilizer costs can be reduced by the action of IgniteS2. By quickly increasing the available nutrients in the soil, less fertilizer needs to be applied. Most soils contain available as well as unavailable nutrients sources. "Unavailable" means soil microorganisms haven't yet broken down the minerals and organic matter into elements plants can use. University testing has shown that Ignites2, when applied broadcast to the soil or placed in furrow at planting, Ignites2 significantly increased concentrations of nitrogen calcium, copper, potassium, magnesium, manganese, phosphorus, boron molybdenum, iron and zinc compared to untreated soil. Not only in the soil, but these increases were increased in vegetative tissue resulting in increased yield, test weight and quality. In nature, plants naturally shed roots and tissue as well as leave behind leaves, plant stubble, etc . Insects, annelids (earth worms) and animals also die and decay over time. As they decompose they return nutrients to the soil. These decompose with the help of soil microorganisms called "decomposers". The decomposers breakdown organic matter and also raw mineral elements through a process called "mineralization". Soil microorganisms in the process of breaking down elements, also release enzymes and complex carbohydrates as well as other elements not found in fertilizers and without them plants can't exist. Many home lawns and especially commercial farmed soils often have very low concentrations of beneficial microorganisms. It makes little difference how much fertilizer you apply if the beneficial soil microorganisms are not there in sufficient numbers. Ignites2 helps increase seed germination, plant health and vitality, crop yield, resistance to disease pressure, while naturally improving soil composition and nutrient availability. Check out AgriGro's electronic brochure in the upper right and get an idea why AgriGro's products are not the run of the mill agricultural product. They are the result of innovative research and rock solid soil biology. In the soil, Ignite helps to address nutrient deficiencies and other stresses before they affect plant health and cause losses in crop quality and yield. It helps to improve soil structure, increase fertilizer efficiency, improve seed germination and growth, increases root density, boost yield and reduces disease patogens.It helps decrease fertilizer costs by quickly bringing more soil nutrients into solution and make them available to plants.